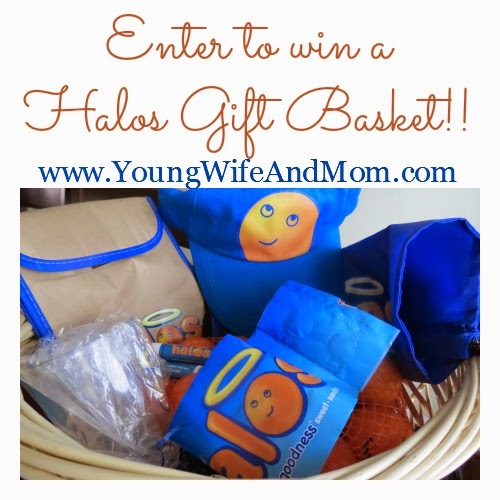 Sponsored: Wonderful Halos Review & Giveaway! Now that the holidays have come and gone, the kids are heading back to school and lunches need to be packed. One of my favorites to put in my daughter's lunch box are Wonderful Halos. They are, by far, her favorite thing to munch on. Each time she's with me on a grocery trip she makes sure Mommy gets her some. It's nice to have a healthy option you can just toss in her bag that she can peel herself when she's ready to eat. They are great for snack time as well. This mom's been known to sneak a few for herself during the day when the little one is at school. Wonderful Halos are sweet, seedless and easy to peel mandarins that are perfect for little ones. Each mandarin is about 50 calories and delivers 45% of the recommended daily value of vitamin C. They are from the same people who brought us POM Wonderful and Wonderful Pistachios (YUM!) Halos are in season from November through April, so be sure to pick some up the next time you are at the grocery store! For even more family fun, be sure to check out the FREE Halos game app for iOS and Android phones. We were provided this amazing a Halos gift basket filled with fun items and coupons including Halos branded flashlight key chains, light up cups, hats, lip balm, a drawstring backpack and of course Wonderful Halos. They would love to give a similar gift basket away to one of my readers. Enter below for your chance to win! Disclosure: I was provided a gift basket for the purpose of review. I have not received, nor will receive, any other compensation for this post. I am an actual customer of this product and all opinions contained in this review are mine.